I use this mask twice a week, and I really like how it is fading my age spots without irritating my delicate, sensitive skin. Also like that it is helping with my enlarged pore areas. I make a single serve each time, because I’m not sure how well it will store in the fridge once mixed. But it is easy to whip up and I only use it twice a week. I just keep a carton of organic egg whites and a lemon in the fridge. Then I always seem to have honey and gelatin packets on hand. You could make it without the gelatin. It will still dry and will rinse off easily. So many of the “store bought” spot fading products gave me a rash or break outs. So I needed to make something gentle but effective. It is a clear mask also, so you won’t scare the kids, either. I mix it together and apply to my face and neck. Then I leave on for 10 to 20 minutes, or until it is dry. You will feel it tightening and pulling. Then I rinse with warm water. Then pat dry (never scrub). You need not worry about salmonella, since the egg white in the carton are pasteurized. Which means they are safe to eat without being cooked. If you use a raw separated egg be careful not to get any in your mouth. It is easier and safer to use the carton variety though. 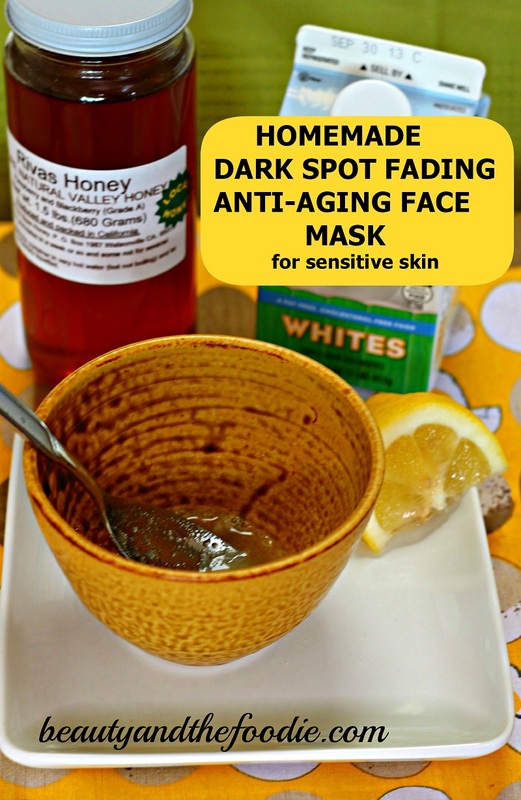 A natural, homemade, anti-aging, face mask for fading dark spots, and firming skin. ½ Tbsp organic 100 % egg whites (I buy the ones in the carton because they are safe to eat just in case you get some in your mouth). Lifts and firms’ skin, and tightens pores. Whisk all ingredients together in a small, pinch bowl. Apply to face and neck, while at a sink. It can be a little a little drippy. Let mask dry for 10 to 20 minutes. It is ready when the mask feels dry and your skin feels tight. Rinse off mask with warm water and face towel until mask is removed. Pat face dry with clean towel. Hi if I don’t want to use gelatine can u give other replacement ingredient thanks. You can omit the gelatin. No need to replace. It would be better if you had the idea on how to store it. I like to make more for longer use. 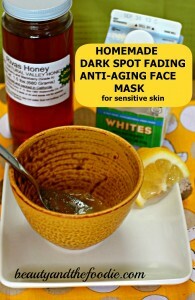 I tried this DIY skincare recipe and it does provide a better result with my skin. Hi Jenny, you can keep it in a container in the fridge for a couple days, but the egg white is perishable, so it can’t keep for very long. Does this treat blackheads too? I have several blackheads and I want to use DIY skincare because I know this is safer compared to other skincare commercial products. 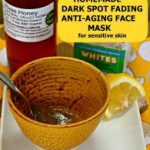 There is so many DIY skincare for treating blackheads but I don’t find them effective. Wendy, I think it should help with blackhead because of the egg white and lemon. I have also had some progress with activated charcoal masks when dealing with blackheads. Also, a little baking soda with honey & lemon scrub can also help with them. I know what you mean though. My son has the most stubborn blackheads around his nose. They seem to to be resistant to most everything! Oh this sounds wonderful. I have all the ingredients and will make some when mine runs out. thanks for sharing, Stacey. I’m going to have try this mask out. I’m always on the lookout for DIY anti-aging tips and recipes. Thank you Authority Nutra for trying it. I hope it helps, Lucy. I would really love to see the effect of this mask on dark spots. If it works I am gonna use it continuously to make my face bright and spot free. I like diy facial mask and now using facial mask with oatmeal, egg and apple. The recipe is very easy and effective. Ingredients: Apple, Egg Yolk, Oatmeal. Blend these 3 ingredients well. Spread the mixture all over your face. Let the mixture stay for about 20-30 minutes. Rinse it off with pure water. You can try this recipe. Interesting mask. Will try it out.